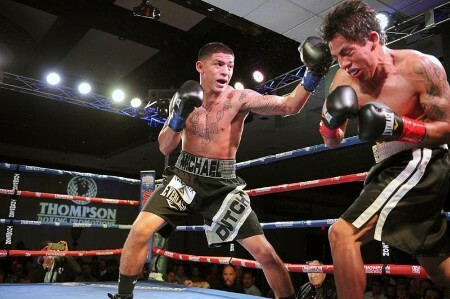 PHILADELPHIA, PENN./ORANGE, Calif. (March 13, 2018)- This Saturday night at the Doubletree Hotel in Ontario, California, budding junior lightweight talent Michael Dutchover (7-0, 5 KOs) headlines the first show of his young career when he faces Ricardo Lopez (7-1-2, 6 KOs). Dutchover, 20, hails from Midland, Tex. but moved to the Los Angeles area last year to take advantage of the rich sparring that the region offers. The former amateur standout is making his first start of the year against a fellow prospect in Lopez who will be eager to give him a fight. All signs point to Dutchover delivering the goods on Saturday night. In the lead up to this fight, he spent several weeks in Guadalajara, Mex. sparring with world champion Oscar Valdez. Thompson Boxing will livestream the main event and the full card on “TB Presents” beginning at 7:00 PM PT. The livestream can be found on the Thompson Boxing facebook page, or on its website at ThompsonBoxing.com. “TB Presents” is anchored by Beto Duran as the blow-by-blow announcer, while Steve Kim will provide expert, color commentary. For regular updates on our fighters, events, and promotions, please like Banner Promotions Facebook Page , and follow us on Instagram and Twitter @BannerBoxing.